Perugia, “city of the infinite view,” (Henry James) might be dubbed the most elegant city in Umbria. But this Umbrian provincial capital city tucks away hidden simple pleasures, too. Like Umberto, making the richest whipped cream-crowned hot chocolate you’ll ever sip. 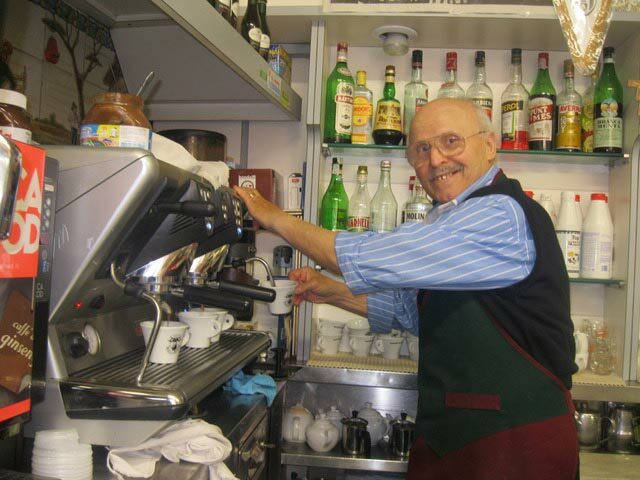 I’ve know him since 1969 when his cappuccini started off my days as a student in Perugia. He’s still making them – and he looks the same: maybe that whipped cream staves off the wrinkles or could it be the exercise of hand-whipping cream all day long for over sixty years? The tour guests in this May’s “Annesialy Inside Umbria Celebration” had to meet Umberto and revel in the goodness he whips up: another “Inside Umbria’ moment not to miss, after all….. Enjoy exploring the many wonders of Perugia, but why not start with the simple pleasures? Read about another INSIDE experience: living Umbria by cooking it up!